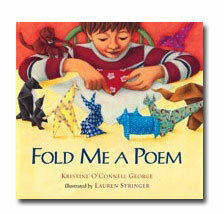 FOLD ME A POEM by Kristine O'Connell George | A creative collaboration of origami and poetry. Scroll down or click below. 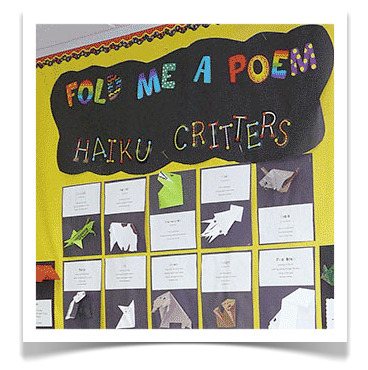 See Fold Me a Poem in the classroom! Purchase using the links above and referral fees are donated to Kickstarter & Donors Choose. Thank you for helping to support these terrific causes. Join a young boy as he creates a world filled with origami creatures of all shapes and sizes out of an array of brightly colored paper. From roosters waking up and buffalo pawing the tablecloth to cheetahs racing lions and moths that yearn for butterfly colors, here is a glimpse into the vibrant imagination of a child. 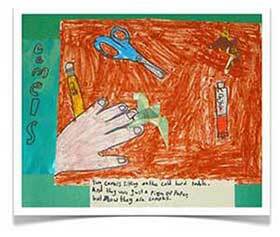 Students can fold a simple dog, then write three different kinds of poems for a fast and easy poetry lesson. 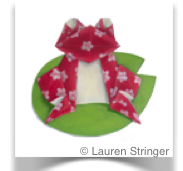 Check out Lauren Stringers folding diagrams for some of the critters in Fold Me a Poem. Sssssssnake, rooster, penguin, giraffe, frog, dog, and bird. Lauren Stringers folding diagrams for some of the critters in Fold Me a Poem. The boy in the back of the room	sat quietly with a stack of colored paper, his fingers were nearly a blur as he folded sheet after sheet of colorful origami paper into fanciful animals. Once he'd folded a zoo's worth of animals, he played with them, talked to them and gave them quirky personalities. His paper animals seemed almost real! Watching him that afternoon, I was struck by the similarity between poetry and origami — how a few spare words, carefully chosen, can bring a scene to life — how a few small folds, artfully made, can bring a sheet of paper to life. Lauren Stringer's sketches for FOLD ME A POEM startled me: Working from only my poems, she had painted what was inside my head! I had not yet met Lauren and we didn't communicate while she was working on the book. So, how did she know that I'd visualized the camel leaning against a salt shaker? Spooky! Most importantly, Lauren clearly saw that this book was not only about origami, but was also an exploration of a child's joy in creating art and weaving that art into a deeply personal, imaginative world. I love Lauren Stringer's evocative art; the Internet doesn't do justice to the gorgeous full-page spreads and her vibrant colors! For that, you will have to see the book in person. Lauren and I hope you enjoy reading Fold Me a Poem and will be inspired to fold some origami and write poems about your own creations. "[An] array of brilliantly patterned papers parade across a young folder's table and around a thematic set of short, pithy poems...[an] engrossing collaboration." "This unusual poetry volume is a dazzling celebration of imagination... Each turn of the page brings a clever new perspective or insight -- even humor [and] creatively models low-cost child's play that requires only a little know-how and a bit in ingenuity."